王志洁, 汪洋, 安志芳, 魏琳娜, 魏莲, 魏登邦. 高原鼠兔组织中精子特异性乳酸脱氢酶的作用机理[J]. 四川动物, 2017, 36(6): 624-631. WANG Zhijie, WANG Yang, AN Zhifang, WEI Linna, WEI Lian, WEI Dengbang. The Role of the Sperm-specific Lactate Dehydrogenase in Ochotona curzoniae Tissues[J]. Sichuan Journal of Zoology, 2017, 36(6): 624-631. *通信作者 Corresponding author, 魏登邦, E-mail:weidengbang@163.com. Abstract: The plateau pika (Ochotona curzoniae) has a strong adaptability to a hypoxic plateau environment. Previous studies found that the sperm-specific lactate dehydrogenase (LDH-C4) gene is expressed in plateau pika somatic cell. In order to shed light on the role of LDH-C4 in plateau pika tissues, we silenced the Ldh-c gene in pika heart, liver and brain by RNA interference, and then the expression levels of Ldh-c gene in these tissues were determined by real-time PCR and Western Blot. Additionally, the activities of LDH, the contents of lactic acid and ATP were also measured by biochemical method. The results indicated that intraperitoneal injection of adenovirus pMultiRNAi-Ldhc could significantly reduce the expression of Ldh-c gene in tissues of plateau pika. Specifically, in the mRNA and protein levels, the expression levels of Ldh-c gene in heart were decreased by 48.11% and 19.27%; in liver were decreased by 70.16% and 25.82%; in brain were decreased by 49.08% and 25.36%, respectively. Meanwhile, when Ldh-c gene expression was silenced, the activities of LDH, the contents of lactic acid and ATP in each tested tissues were generally decreased by 25.58%, 41.94% and 21.23%; 28.16%, 15.90% and 24.66%; 16.65%, 12.78% and 18.50%, respectively. 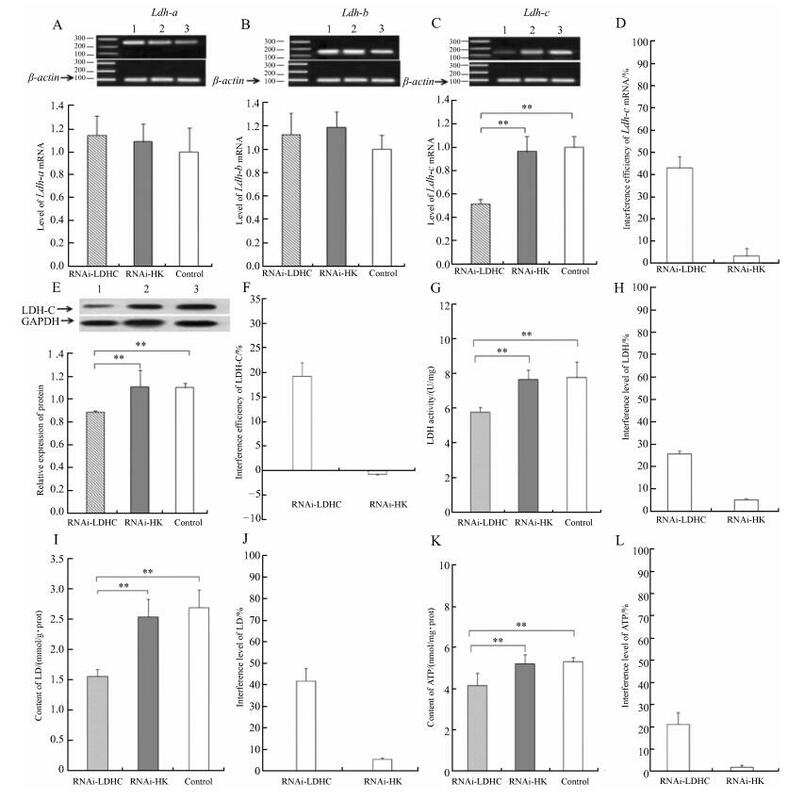 These results suggested that under the condition of severe hypoxia, the heart, liver and brain tissues of plateau pika can generate part of ATP uponLDH-C4 catalyzed anaerobic glycolysis and therefore enhance the adaptation to the hypoxic environments. 图 1 Ldh-c基因在高原鼠兔心肌组织的表达(n=9) Fig. 1 The expression of Ldh-c gene in the heart of Ochotona curzoniae (n=9) A. Ldh-a基因mRNA的表达水平，B. Ldh-b基因mRNA的表达水平，C. Ldh-c基因mRNA的表达水平，D.腺病毒pMultiRNAi-Ldhc对Ldh-c基因的干扰效率，E. LDH-C蛋白的表达水平，F.腺病毒pMultiRNAi-Ldhc对LDH-C蛋白的干扰效率，G.腺病毒pMultiRNAi-Ldhc对乳酸脱氢酶(LDH)比活力的影响，H.腺病毒pMultiRNAi-Ldhc对LDH的干扰效率，I.腺病毒pMultiRNAi-Ldhc对乳酸(LD)含量的影响，J.腺病毒pMultiRNAi-Ldhc对LD的干扰效率，K.腺病毒pMultiRNAi-Ldhc对ATP含量的影响，L.腺病毒pMultiRNAi-Ldhc对ATP的干扰效率；其中A、B、C和E图上侧电泳图和免疫印迹图分别表示Ldh-a、Ldh-b和Ldh-c基因mRNA以及LDH-C蛋白的表达模式；1、2和3分别表示干扰组、空壳组和空白组；*P＜0.05，**P＜0.01；图 2、图 3同。	A. expression level of Ldh-a mRNA, B. expression level of Ldh-b mRNA, C. expression level of Ldh-c mRNA, D. interference efficiency of pMultiRNAi-Ldhc on Ldh-c gene, E. expression level of LDH-C protein, F. interference efficiency of pMultiRNAi-Ldhc on LDH-C protein, G. effect of pMultiRNAi-Ldhc on the activity of lactate dehydrogenase (LDH), H. interference level of LDH, I. effect of pMultiRNAi-Ldhc on the content of lactic acid (LD), J. interference level of LD, K. effect of pMultiRNAi-Ldhc on the content of ATP, L. interference level of ATP; in figs. A, B, C and E, the electrophoresis and Western Blot results represent the expression pattern of Ldh-a, Ldh-b, Ldh-c mRNA and LDH-C protein, respectively; 1, 2 and 3 represent RNAi-LDHC, RNAi-HK and control, respectively; *P < 0.05, **P < 0.01; the same as fig. 2 and fig. 3. 图 4 腺病毒pMultiRNAi-Ldhc对高原鼠兔血清中乳酸脱氢酶比活力和乳酸含量的影响(n=9) Fig. 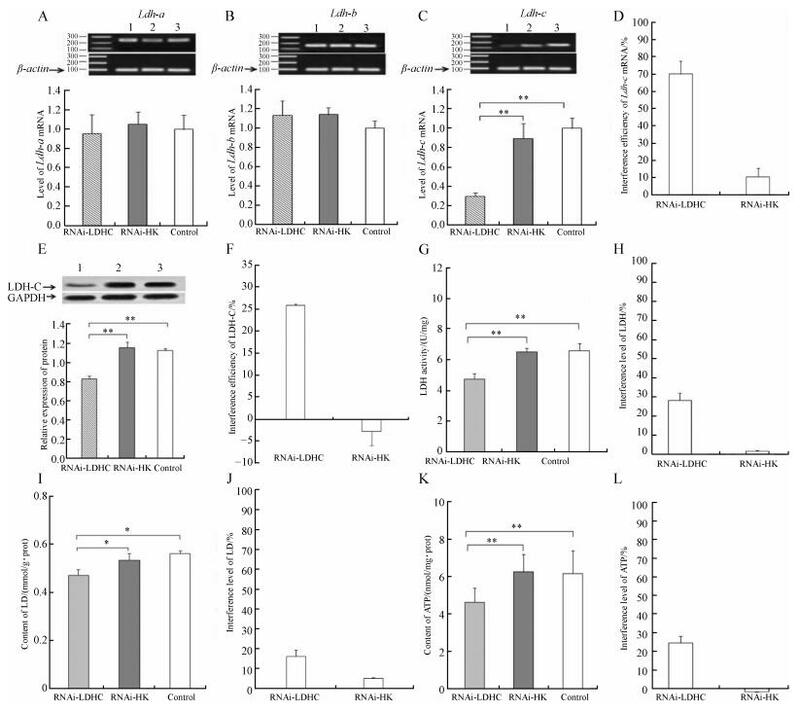 4 Effects of pMultiRNAi-Ldhc on the activity of lactate dehydrogenase (LDH) and the content of lactic acid (LD) in the serum of Ochotona curzoniae (n=9) A.腺病毒pMultiRNAi-Ldhc对高原鼠兔血清中LDH比活力的影响，B.腺病毒pMultiRNAi-Ldhc对高原鼠兔血清中LD含量的影响，C.腺病毒pMultiRNAi-Ldhc对高原鼠兔血清中LDH和LD的干扰效率；*P＜0.05。	A. effect of pMultiRNAi-Ldhc on the activity of LDH in plateau pika serum, B. effect of pMultiRNAi-Ldhc on the content of lactic acid in plateau pika serum, C. interference level of LDH and lactic acid in plateau pika serum; *P < 0.05. 丁晓涛, 何秀琼, 曹玉琼, 等. 1999. 高原鼠兔寄生虫感染调查报告[J]. 四川动物, 18(1): 34. 姜国良, 于晓, 徐恺, 等. 2013. 腹腔和皮下注射D-半乳糖衰老大鼠模型分析[J]. 中国老年学, 33(5): 1101–1103. 姜怀春, 李宏. 2004. RNAi的研究进展[J]. 重庆工商大学学报(自然科学版), 21(6): 570–574. 李筱, 魏莲, 汪洋, 等. 2015. 高原鼠兔心脏中Ldh-c基因的表达及其对无氧糖酵解水平的影响[J]. 生理学报, 67(3): 312–318. 齐新章, 王晓君, 朱世海, 等. 2008. 高原鼢鼠和高原鼠兔心脏对低氧环境的适应[J]. 生理学报, 60(3): 348–354. 施银柱, 樊乃昌. 1980. 草原害鼠及其防治[M]. 西宁: 青海人民出版社: 67-105. 王晓君, 魏登邦, 魏莲, 等. 2008. 高原鼢鼠和高原鼠兔红细胞低氧适应特征[J]. 四川动物, 27(6): 1100–1103. 魏琳娜, 魏莲, 汪洋, 等. 2015. 高原鼠兔肝中Ldh-c基因的表达及其对无氧糖酵解水平的影响[J]. 动物学杂志, 50(6): 846–854. 许利娜, 魏莲, 汪洋, 等. 2015. 高原鼠兔脑组织中精子特异性乳酸脱氢酶的作用[J]. 兽类学报, 35(4): 431–437. 祝春青, 陈冬波, 王苗, 等. 2012. 腹腔注射百草枯构建小鼠肺纤维化模型[J]. 生物技术通讯, 23(4): 563–566. Everse J, Kaplan NO. 1973. Lactate dehydrogenases:structure and function[J]. Advances in Enzymology & Related Areas of Molecular Biology, 37(1): 61–133. Goldberg E. 1975. Lactate dehydrogenase-X from mouse testes and spermatozoa[J]. Methods in Enzymology, 41(1): 318–323. Goldberg E. 1985. Reproductive implications of LDH-C4 and other testis-specific isozymes[J]. Experimental Clinical Immunogenetics, 2(2): 120–124. Smithies O. 1959. Zone electrophoresis in starch gels and its application to studies of serum proteins[J]. Advances in Protein Chemistry, 14(10): 65–114. Wang Y, Wei L, Wei D, et al. 2015. Testis-specific lactate dehydrogenase (LDH-C4) in skeletal muscle enhances a pika's sprint-running capacity in hypoxic environment[J]. International Journal of Environmental Research & Public Health, 12(8): 9218–9236. Zhu SH, Qi XZ, Wang XJ, et al. 2009. Difference in oxygen uptake in skeletal muscles between plateau zokor (Myospalax rufescens baileyi) and plateau pika (Ochotona curzoniac)[J]. Acta Physiologica Sinica, 61(4): 373–378.